#ElectronicHalloween 2015 at Adafruit – 10/22 Update « Adafruit Industries – Makers, hackers, artists, designers and engineers! Prior installments: 9/14, 9/22, 9/25, 9/27, 10/8. Meanwhile, Noe adapted the Uncanny Eyes project for a really cool Halloween doorbell. A page will be added to that guide soon with links to the 3D files and some pointers on wiring this into one’s existing doorbell. 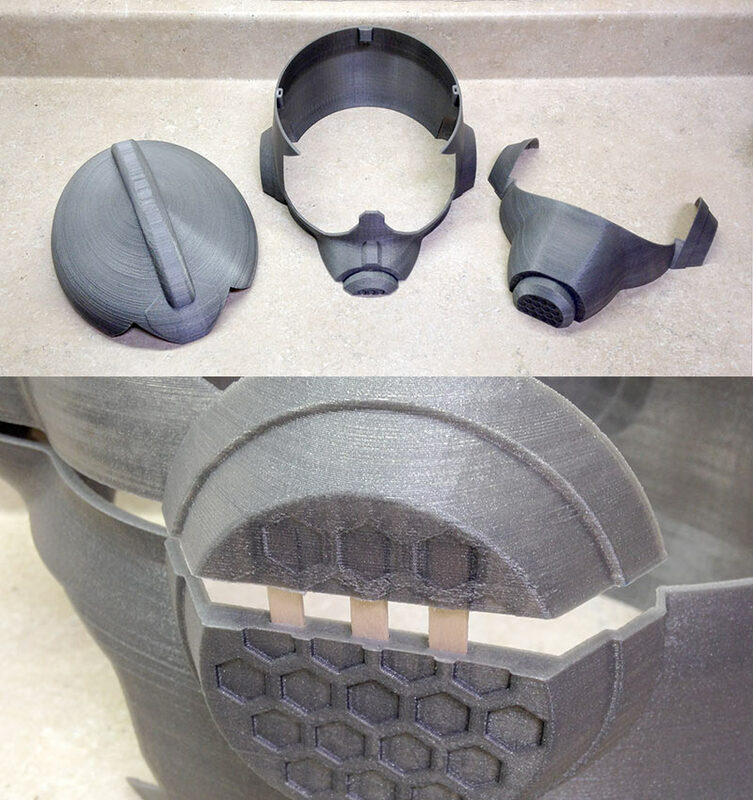 Getting back to the Wasp project now…one of the big showpieces of this project is Pedro’s 3D-printed helmet design. I’ve been trying to produce one of these here but my printer refuses to play along. It might get a couple dozen layers into it before the print shears off the bed due to filament curl. After roughly 40 billion tries I finally got a viable print by using a huge brim and sneaking in with a hot glue gun mid-print in a desperate attempt to hold the piece in place on the bed. This eventually worked. But it had taken so many attempts and so much time that I’d already asked the Ruiz brothers if they could print one out and ship it to me, which they did, using a combination of Ultimaker 2 and Type A working in parallel! 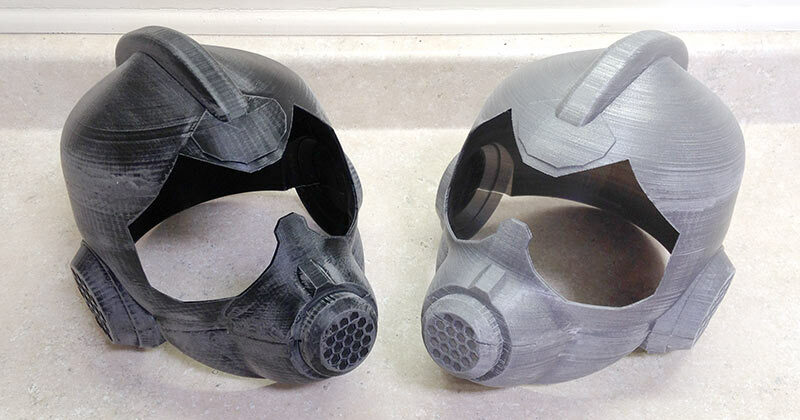 The helmets appear dull in spots because I’d sanded them in preparation for the next step, using Smooth-On XTC-3D resin to give the helmets a smooth, glossy finish that could then be painted. I thought this would look better than the obviously-3D-printed raster effect. Also, hey, I had a few other projects going involving other resins, so it’d be convenient and efficient to do all these jobs the same day. Resins can be fussy things, affected by temperature, age, mix ratios, contamination…I wouldn’t be surprised to learn the phase of the moon plays a role as well. It’s a “flash cure.” This can happen when you have too much resin in one place, especially when it’s hot (as it was this day). As I mentioned above, temperature affects resin. Warmer day equals faster cure. But also, resins produce an exothermic reaction as they cure…they generate heat. Which makes it cure faster. Which generates heat. This can have a snowball effect leading to the flash cure (big ones can be nasty enough to cause burns). This was strange though, because it’s just a tiny Dixie cup’s worth and even on a warm day I wouldn’t expect this. Ah well, I set the fuming cup in the driveway, far away from anything, to finish its little hissy fit while I mixed a fresh batch (then spreading it between multiple cups to reduce the exothermic reaction and flash cure risk). Since I was on a tear, I went ahead and did both helmets this way. Look how efficient I’m being! How much time I’m saving! I finished these and my other resin-ing projects, let them cure overnight, then checked on everything the following day. My other projects came out fine. The two helmets…they were basically covered in Abba Zabba. Sticky, un-cured…ruined. Both of them. Spent the next two days cursing Smooth-On, how their products used to be so great but now had no shelf life (I’d originally opened the XTC-3D mid-summer), saying and thinking horrible things about them until it dawned on me in the shower for some reason (all answers to all problems seem to come in the shower)…why is the “Part A” bottle bigger than “Part B” when it’s supposed to be a 1:1 mix ratio? Because it requires a 2:1 mix ratio, you idiot. 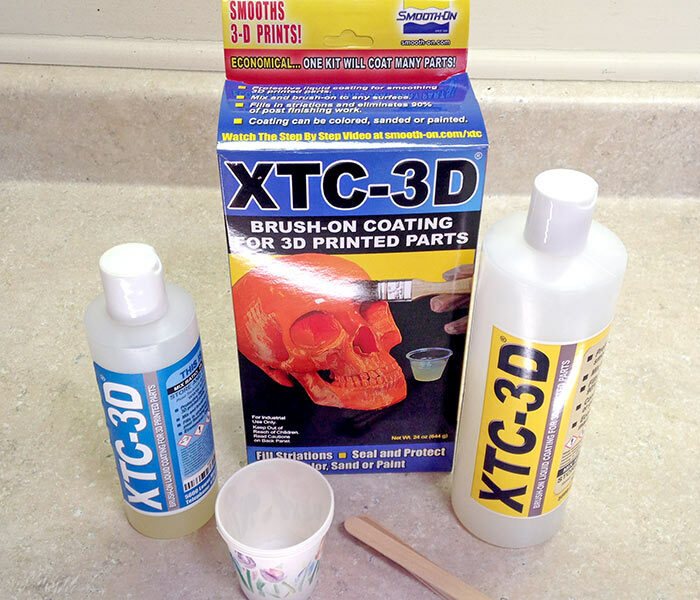 Working with multiple products that day, the primitive lizard part of my brain had been running on auto-pilot and used a 1:1 mix (which some resins use) on everything (which the XTC-3D does not). I ruined it. Not Smooth-On, not the weather, the stir sticks or cups, nor phase of the moon for that matter. All on me. Spent the next several days scraping, sanding, re-coating and anything-I-could-try to salvage these helmets. Meanwhile, other parts of the project (namely wings) were not getting done. Eventually I swallowed my pride and asked the Ruiz Bros to ship out another helmet. Luckily they had a spare already printed, should arrive tomorrow. I’ll use that one raw, no resin this time! So I have an impossibly short amount of time to try to finish these wings (and not screw them up too…Erin did such a wonderful job on the membranes). Fortunately I’d gotten a good start on them before the whole helmet debacle and time-sink. 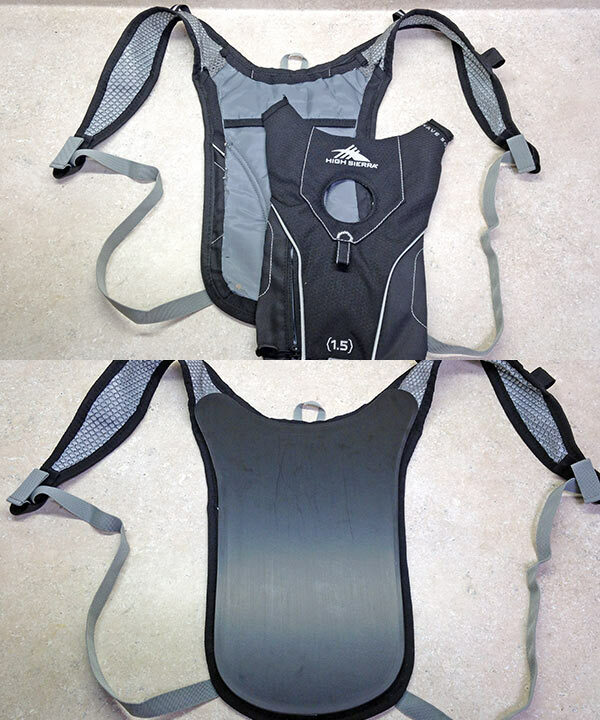 The starting point for the wing frame is a Camelback-style hydration backpack. This made more sense than making the harness from scratch…the backpack was very affordable and slim and they’ve already perfected the design, no trial and error required. The water bladder and outer shell were removed, and a piece of Sintra (foamed PVC plastic) was cut to the same shape…this would give a solid thing to which wings, servos and batteries could be attached. A flat sheet of Sintra is a bit wobbly though. 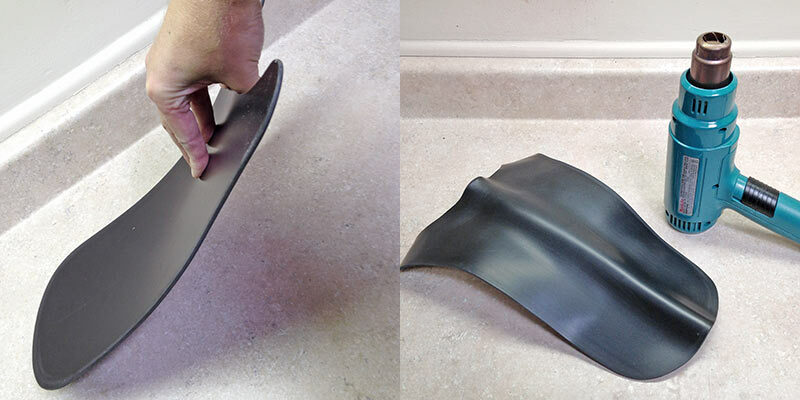 But it can be reshaped using a heat gun. Applying compound curves to the shape makes it much more rigid (also more comfortable, conforming to the curves of the back). So while it looks like it’s designed as a functional spine protector, that’s really just to create a corrugation effect. Tomorrow I’ll try mounting servos and things on this. Somehow, perhaps magic. Wish me luck!